There was some, but not much, doubt around Washington’s election. Washington was arguably the preeminent American but there were supporters of John Adams, Thomas Jefferson, Alexander Hamilton, Guy Carleton and William Briggs scattered about. Luckily, for the new country, every one of these potential rivals insisted that their supporters vote for Washington. All had a good relationship with the Revolutionary General and there were other considerations as well. Jefferson had to be deferential to Washington since Washington was the undoubted leader of Virginia. Hamilton saw Washington as a father figure so he would not challenge his mentor. Briggs’ political support waned beyond the Caribbean basin so the electoral votes simply were not there. Carleton considered a run but determined that challenging Washington, combined with his leadership of Quebec and anti-federalist stance, would do more harm than good in the long run. It should be noted that Newfoundland and Rhode Island both missed out on the first election as they had yet to ratify the constitution . On March 3, 1790, the last session of the Articles Congress was held. They lacked a quorum and gaveled in just to adjourn sine die. 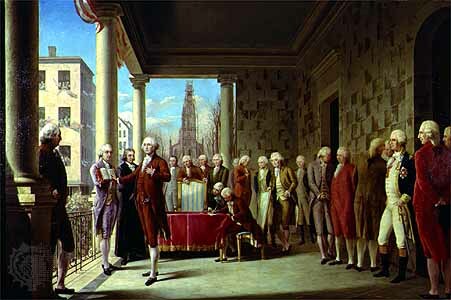 On March 5, 1790, the 1st Congress of the United States convened. Members of the new House and Senate took their seats at Federal Hall in New York City. This initial meeting was largely ceremonial as neither the House nor the Senate held a quorum. The first meeting of the House, with a quorum, was held on April 2 where they elected Thomas Dunn of Jamaica as Speaker of the House. The Senate met a week later and elected John Langdom of New Hampshire as their President Pro Tempore. That same day, the House and Senate met in joint session to certify the elections of Washington and Adams. John Adams would be sworn in by the end of April and Washington took the oath of office on May 1, 1790. That September, the Congress took up a number of proposed constitutional amendments. As a prerequisite for ratification in many states, the anti-federalist factions demanded a comprehensive bill of rights. These ranged from broadly agreed upon concepts like the freedom of speech to minute proposals such as a guarantee to the right to distill rum and other spirits. Attempts had previously been made at including such rights at the Philadelphia Convention. Elbridge Gerry and George Mason sought the direct inclusion of a Bill of Rights but were defeated in the closing days of the Convention. Ultimately, the omission of a Bill of Rights in Philadelphia placed the entire ratification process at the state level in peril. It became the central rallying point of the anti-federalist opposition and threatened everything up until that point. The federalist proponents of the Constitution argued such a collection of rights was unnecessary. James Madison referred to such guarantees as “parchment barriers” to would not actually protect against tyranny. James Wilson made a philosophical argument that enumerating people’s rights would imply that non-enumerated rights did not exist. A popular anti-federalist rebuttal came from history. They cited the enumerations of rights in documents such as the English Bill of Rights and the Magna Carta. “In the first place we have conceded to God, and by this our present charter confirmed for us and our heirs for ever that the English church shall be free, and shall have her rights entire, and her liberties inviolate; and we wish that it be thus observed. This is apparent from the fact that we, of our pure and unconstrained will, did grant the freedom of elections, which is reckoned most important and very essential to the English church, and did by our charter confirm and did obtain the ratification of the same from our lord, Pope Innocent III., before the quarrel arose between us and our barons. This freedom we will observe, and our will is that it be observed in good faith by our heirs for ever. The saga played out during the state ratification conventions . The first several states (Delaware, New Jersey, Georgia, and Connecticut) ratified the Constitution with relative ease. The debate in Pennsylvania was bitter and while ratification passed early, the debate there influenced conversations elsewhere. Of the protracted and difficult ratification conventions, most took two forms. The first was a debate less about federal power and more about the direction of state sovereignty and identity. Francophone states like Quebec, Dominica and St. Vincent took many more weeks than their English-speaking counterparts to ratify the constitution and officially side with the United States for the long haul . States like Barbados, Jamaica, Newfoundland and the Bahamas actually questioned whether the Constitution was strong enough . As isolated maritime states, they had a vested interest that the new Congress would be able to effectively provide for a strong navy and protect their powerful commercial interests in sugar (and in Newfoundland’s case, cod fishing). The debates in New Hampshire, Virginia, Massachusetts and New York squarely focused on questions of federalism and the inclusion of a bill of rights. These debates also helped to drag out ratification in Rhode Island and North Carolina. Of course, other political factors turned those conventions into quagmires. Anti-federalists Samuel Adams and John Hancock pioneered the compromise that allowed these mid and late conventions to progress. Massachusetts agreed to ratification if the convention proposed amendments that the Congress would then take up. Massachusetts proposed amendments including a grand jury indictment requirement in capital cases and an explicit state reservation of power in those areas not expressly granted to the federal government. These proposals would go on to be included in the Bill of Rights and opened the floodgates of other proposals and ratification agreements . An adjustment to numbering . Federalist representatives were loath to adopt the amendments. This was partially due to politics, but also to avoid the appearance of instability in the new government. One of the few ardently federalist Québécois representatives, Jean Pierre Rochambeau, warned Madison that the appearance of chaos and instability could easily led to a second constitutional convention and the adoption of a third governing document. If that were to happen, he could not guarantee that Quebec and some of the distant Caribbean states would be around to adopt such a document. Madison and many in the 1st Congress were well aware that these early days were critical and they were on their last chance to get things right. Despite his misgivings (shared by Madison) about the necessity of a Bill of Rights, Rochambeau became instrumental in his own proposals, subsequent work with Madison and work to shore up votes amongst the Francophone representatives. Rochambeau’s “Quebec Amendments” stemmed from the ratification debate in Quebec and were influenced by the Philadelphia Convention, state constitutions, the Magna Carta, Montesquieu, Rousseau and ongoing events in France as that country spiraled towards revolution. The ratification debate in Quebec had been considerably different than the debates elsewhere. This was because of the culture and legal difference between Quebec and the other states. Most of the other states followed English traditions and utilized common law. The Caribbean had some French traditions but for the most part those islands were small and were often traded between conquering European powers. As long as their sugar plantations remained intact, slavery continued and the wealth from trade flowed the actual laws and possessor of the island really didn’t matter. If anything, the American Revolution was a seminal moment for these locations because the ownership of the massive sugar wealth transferred from Europe to the New World. Before the Revolution, the plantations were owned by Europeans who appointed overseers and officials to travel across the Atlantic and run their operations. Depending on the island in question, only 20-50 percent of plantation owners actually lived in the Caribbean. The Revolution expelled their imperial set up and many overseers and (white) island inhabitants took the property in question for their own. Not a few Europeans cried foul that a revolution about liberty and rights (including property rights) had seen such a blatant usurpation of land ownership but the new country was more than willing to turn a blind eye to such trivialities. Quebec, however, followed a much more ancient French system than elsewhere. Nearly two centuries before, Cardinal Richelieu had established a semi-feudal system of manors to divide land (which the king nominally possessed) and encourage settlement and development. These manors took the form of long narrow strips of land adjourning the St. Lawrence River, and other navigable bodies of water, from when French Quebec grew around. When the English took over after the Seven Years War, there was much concern that English traditions and common law would usurp the long-standing order of Quebec. This concern was one of the factors in the creation of the 1774 Quebec Act which, in addition to its generous land grants in the Ohio Valley (which irked English colonists along the Atlantic Coast), ensured the manor system would continue, guaranteed the free practice of Catholicism, and allowed French civil law in matters of private law and established English common law in matters of public law. The debate in Quebec City over ratification was about far more than just culture differences and questions of federalism. In a way, it was a debate that had been ongoing since the end of the Seven Years War: could a largely French cultural/legal/political territory co-exist in a larger English cultural/legal/political empire. To their credit, the Québécois delegates to the ratification convention were willing to make such a difficult proposition work. The new constitution provided few mandates on how the states should govern themselves and Quebec wanted to ensure that separation. There needed to be guarantees of liberty so that English traditions could not be imposed on non-English regions. More than anything the Québécois wanted three things. First, to protect Catholicism in a mostly protestant country. Second, to guarantee civil law and established systems of property ownership in a country that would largely follow common law. Third, to protect the French language in their home state. The Language Clause had actually be added to the constitution before the bill of rights so that matter had already been settled. The two other desires are where the Quebec Amendments came from. An adjustment to the Preamble that any society in which the guarantees of rights is not assured, nor the separation powers determined . A statement that all powers not delegated to the federal government under the constitution are reserved by the states and the people. There are two reasons history remembers the Quebec Amendments and the Madison Amendments over the other proposals. First, both are the best summations of the bill of rights from the twin legal and philosophical perspectives of the young United States. Madison’s proposals represent the best of the English tradition, drawn from the colonial and state constitutions, the Magna Carta and the English Bill of Rights. The Quebec Amendments represent the best of the French tradition, drawn from the history of Quebec and France as well as noted [European] continental philosophers like Rousseau and Montesquieu. Second, the ideas laid down in both sets of proposals would form the core of the eventually adopted Bill of Rights. Quick alliances began to form over the various proposals. Federalists attacked the Madison proposals while some anti-federalists dug their heels in and quietly began pushing for wholesale changes to the body of the constitution. Rochambeau formed a coalition of representatives from Quebec, Dominica, St. Vincent and Grenada; all locations with French legal traditions (at least up until the Seven Years War when the British took over). Rochambeau then forged an alliance with Madison and the two were able to get their proposals sent to a select committee for revision and unification. The select committee consisted of 14 members and made some significant revisions and combinations of the proposals. They threw out changes to the Preamble and sent revisions to the floor of the House in early October of 1790. Up until this point, the various amendments were to be placed into the text of the constitution as it existed but Roger Sherman of Connecticut convinced the House to place the amendments at the end of the existing document so that the constitution would “remain inviolate”. This move by Sherman, and the removal of the text from the preamble, caused several more clauses from the Quebec Amendments to be shucked out entirely. Rochambeau’s sixth, ninth, twelfth and fifteenth proposals were thrown out, not because the body disagreed with them, but because they were seen as philosophical intent being plugged into a document about the mechanics and limitations of government. The only place for waxing poetic about where the rights of man came from was the preamble and the House overwhelmingly liked the preamble as it stood. Congress shall make no law respecting an establishment of religion, or prohibiting the free exercise thereof; or abridging the freedom of speech, or of the press; or the right of the people peaceably to assemble, to petition the Government for a redress of grievances; or any act that does not constitute a clear danger or threat to society. Congress shall make no law depriving a person of their life, liberty or property without due process of law; nor shall private property be taken for public use without a just and prior indemnity. No person shall be held to answer for a capital, or otherwise infamous crime, unless on a presentment or indictment of a Grand Jury, except in cases arising in the land or naval forces, or in the Militia, when in actual service in time of War or public danger; nor shall any person be subject for the same offence to be twice put in jeopardy of life or limb; nor shall be compelled in any criminal case to be a witness against himself; nor shall they be held to answer for those actions committed in the defence of self or others. The force of the law shall not exceed what is evidently necessary to enforce it; nor shall those in a position of authority use the force of law in an arbitrary or capricious manner. The right of the people to question any public tax, its uses, basis, collections, proportions and distributions shall not be violated; nor shall any public official inhibit the right to request a reasonable accounting or public monies. The powers not delegated to the United States by the Constitution, nor prohibited by it to the States, are reserved to the States respectively, or to the people . Obtaining the necessary three-fourths consent of the states for the ratifications was difficult. Only New Jersey ratified the amendments before the end of 1790 and even then, it rejected article two. Ratifications of the articles crawled in throughout the spring of 1791. The results were mixed. Articles one, two, and twelve all received some blowback. Georgia stubbornly refused to ratify the articles on the belief that a bill of rights was unnecessary. Massachusetts, Connecticut, the Bahamas and Nova Scotia all suffered deadlock between their upper and lower chambers. Eventually, Jamaica ratified articles three through fifteen on February 9, 1792. Those articles promptly became amendments one through thirteen. : In our timeline, North Carolina and Rhode Island did not participate in the first presidential election as they had yet to ratify the constitution. New York also did not participate as it never actually selected its electors for the final vote. Due the extended timing, this shifts a bit in this timeline. : Everything to this point is true in our timeline, even the excerpts from the historical documents. : Due to the difference in culture, you’ll notice the French speaking states tend to drag a bit on their political debates. : In our timeline there was really one series of political debate over ratification and it was federalism versus anti-federalism. Basically, the question was should the United States be a confederation of sovereign states or a sovereign state comprised of (essentially) very powerful provinces. In many ways we are still having that debate today. In this timeline, that debate still exists but is augmented by the questions of culture and questions of geopolitics. French states would want to make sure they have a significant seat at the table. States isolated by the ocean would want assurances that the mainland would treat them as equals and help provide for their defense. : This is true of our timeline as well. : Madison experienced a rapid evolution in outlook regarding the bill of rights. Primarily this was probably due to political expediency. Madison saw the constitution as his baby and philosophically did not believe any bill of rights was necessary. When James Monroe became a serious threat to kicking him to the political curb, Madison adopted the cause of the bill of rights because it wasn’t a hill worth dying on. Eventually he came to view them in a good light. It also helps that after the constitution was adopted his alliance with Hamilton began to fray. As the initial constitutional debate faded into history, Madison aligned more and more with Jefferson and his agrarian Democratic-Republican vision of the United States while Hamilton became the champion of the Federalist Party and its efforts at creating a strong government backed by productive farms, manufacturing, trading and banking. : These are all Madison’s actual proposals from our timeline. : I based these proposals very heavily on the French Declaration of the Rights of Man which was published in 1789 in our timeline and would definitely assist Rochambeau in his political thinking. : You’ll notice that most of these are word-for-word copies of the existing Bill of Rights. You’ll also notice that there are sections that are new or have different wording. I’ve italicized these for your purposes, not as a feature that would be seen from the in timeline excerpt. You’ll also note that we have two entirely new amendments and I’ve created two amendments out of the existing Fifth Amendment. This is because the drafters consider the criminal protections article its own thing separate from the strong emphasis on property rights. The bill of rights still does not go so far as to guarantee a right to property as we see in a lot of political philosophy but its much stronger in this timeline due to the French influence of Rochambeau. The provisions for taking with just compensation are different now as well.